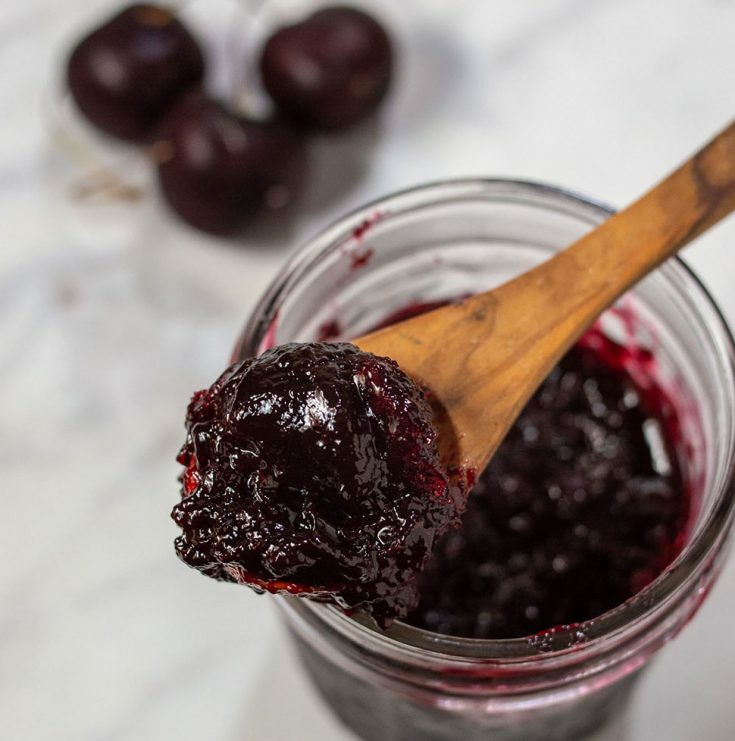 Sweet cherry amaretto preserves have rich cherry flavor with a slight hint of almond from the amaretto. Eat on toast, spoon over ice cream, or swirl into yogurt. When you have 20 pounds of cherries, you’re just not going to be able to eat them or bake with them ALL before some start to rot. I mean, maybe if you have a big enough family, but I don’t. Anyway, cherry preserves are one of my favorites, so I knew I wanted to can with some of them. 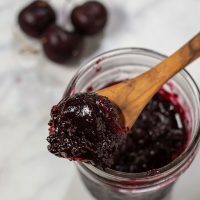 I’ve made other cherry jams in the past, so I considered a few flavors before settling on this one. I considered a blend of stone fruits. But I really wanted the cherry flavor, and when considering flavors to complement the cherry, the one everyone thinks of first is, of course, almonds. I don’t know if it’s possible to make preserves with actual nuts, but you can get that almond-y flavor with amaretto, almond-flavored liqueur. First, the cherries are macerated for 24 hours in a mixture of amaretto and sugar. 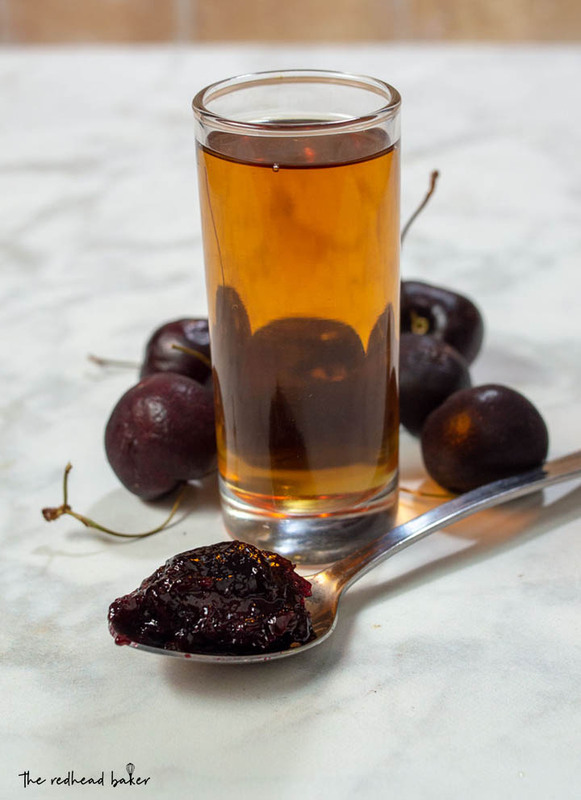 Then the cherry juices and amaretto and reduced with pectin, then boiled with cherries and lime juice. 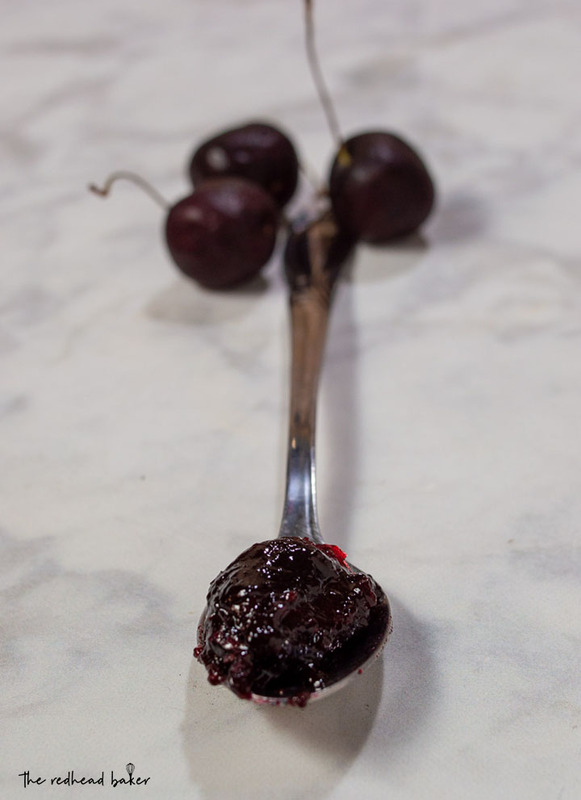 The resulting jam is intensely cherry-flavored with a subtle almond-y after-taste. It is amazing! 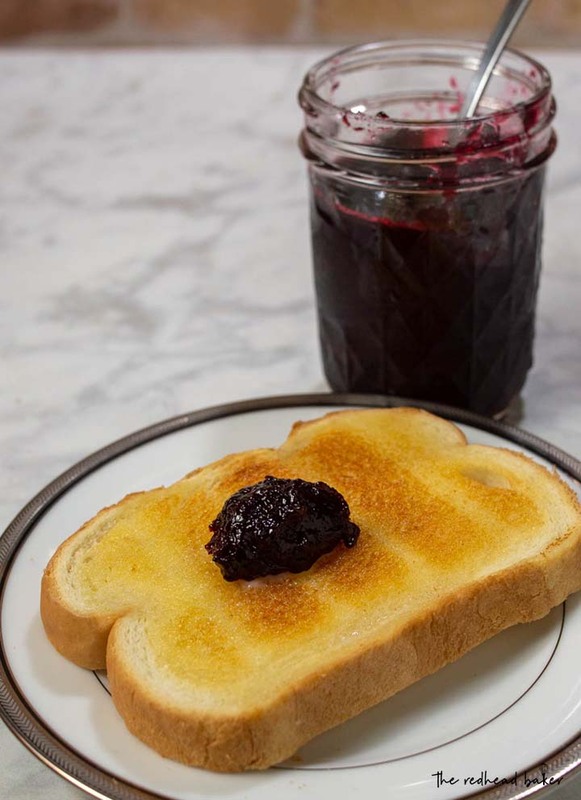 It is delicious on toast, but you can do so much more with jam, like warming it before spooning over ice cream, swirling it into yogurt or oatmeal, use it as a filling between cake layers, use it to fill doughnuts, or use it to top waffles or pancakes. Homemade canned preserves that are made with sugar and canned in boiling water (like this one) that are stored in a cool, dry place should last about 2 years unopened. Once opened, store in the refrgierator, and use within 3 months. Placed the pitted, halved cherries in a large mixing bowl. Sprinkle with the sugar and add the amaretto. Gently mix the cherries until coated with the sugar. Cover the bowl with plastic wrap and refrigerate 24 to 48 hours. Fill a large (at least 20 quarts) with hot water. Wash the jars and flat lids with hot, soapy water. Put the jars in the canning pot and fill the pot with hot water. Heat over medium-high heat to keep the jars hot. Place the lids in a heat-proof bowl. 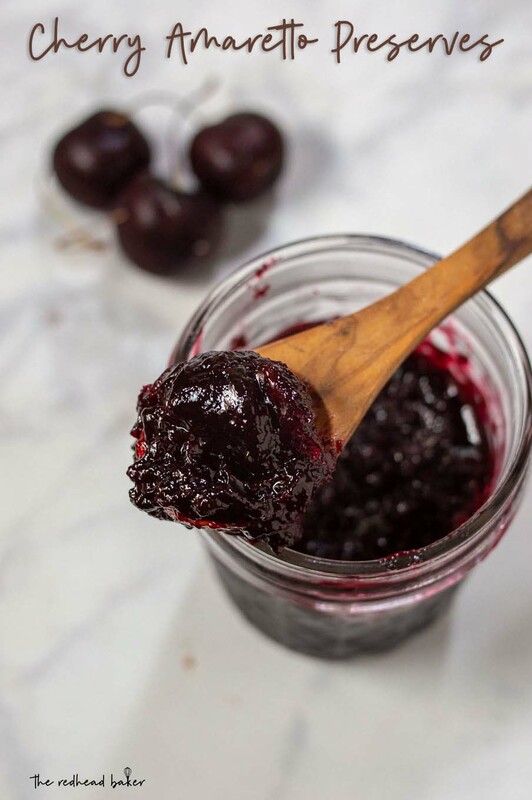 Pour the cherries into a colander set inside a large enameled cast-iron Dutch oven. Return the fruit to the mixing bowl. Add the pectin to the juice in the Dutch oven and bring to a boil over medium heat. Cook, stirring occasionally, for about 10-15 minutes, or until the juice starts to reduce. Add the cherries and lime juice to the Dutch oven. Simmer, stirring often, for 5 minutes. Move some of the boiling water with a ladle from the canning pot into the heat-proof bowl containing the lids. Lift the jars from hot water with canning tongs and line them up on a clean tea towel, then pour the water out of the heat-proof bowl and off the lids. Use a wide-mouth funnel to fill the jars up to 1/4” below the rim. Use a clean towel to wipe any preserves off the rims, then top each jar with a lid. Place a ring on each jar and twist, but don't tighten all the way -- only just until you start to feel resistance. Place the jars back in the canning pot and make sure they are covered by at least 1 inch of water. Bring to a boil and process for 5 minutes. Remove the jars from the boiling water and place on a folded towel and allow to sit, undisturbed, for 24 hours. Check the seals of the lids after 1 hour. If it has, finish tightening the ring and label your jars. If a seal has not formed, refrigerate the jar immediately.